Good Morning, and welcome to Facebook Fridays! for Friday, August 29, 2014. Are bad things happening to you? Have you had a run of really lousy luck? And here's the really big question, is someone working against you? If you are just slightly messed up, a cleansing and protection may be all you want or need. But if the enemy is in your family or your town, or works on the job with you, and is continually using that stuff to hurt you, you cannot just cleanse yourself and do a protection, for they are steady working against you. 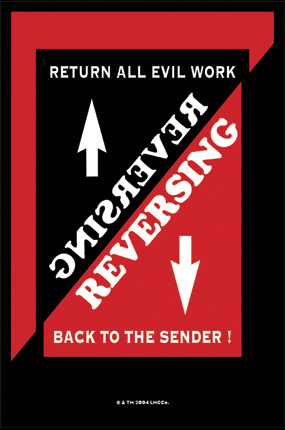 In such a culture of tricking and long-term enemy work, Reversing becomes a better line of defense. 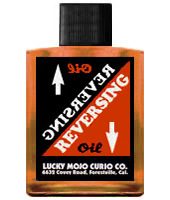 Fortunately, for those of you experiencing this sort of dilemma, the Lucky Mojo Curio Company is featuring its potent line of Reversing products in this week's giveaway, and THREE lucky winners will gain the powerful aid of Reversing! Our grand prize winner gets our full array of Lucky Mojo Reversing products: A blessed and dressed Reversing Vigil Candle; a bottle of Reversing Dressing Oil; and 1 packet each of Reversing Bath Crystals, Incense Powders, and Sachet Powders. Our two runner-ups get Lucky Mojo Reversing Power Packs (a bottle of Reversing Dressing Oil, and 1 packet each of Reversing Bath Crystals, Incense Powders and Sachet Powders). then scroll down, and post a comment to the Facebook Fridays! status message for August 29, 2014. First thing tomorrow morning, we will select THREE winners at random, and ask them to message the Lucky Mojo Curio Company Facebook Page with their mailing addresses, so we can send them their FREE Healing products. We have a winner! In fact, we have THREE lucky winners! Our Facebook Fridays! winners for August 29, 2014 are: Roseann Turk, Camille Elizabeth Kea, and Jonathan Russell.